There is a paid parking lot on Little Collins St, a 2 minute walk to our venue. Limited street parking available - ticketed. The 86 and 96 trams that run up Bourke St both stop 1 minute away from our venue. The closest train is Parliament station. 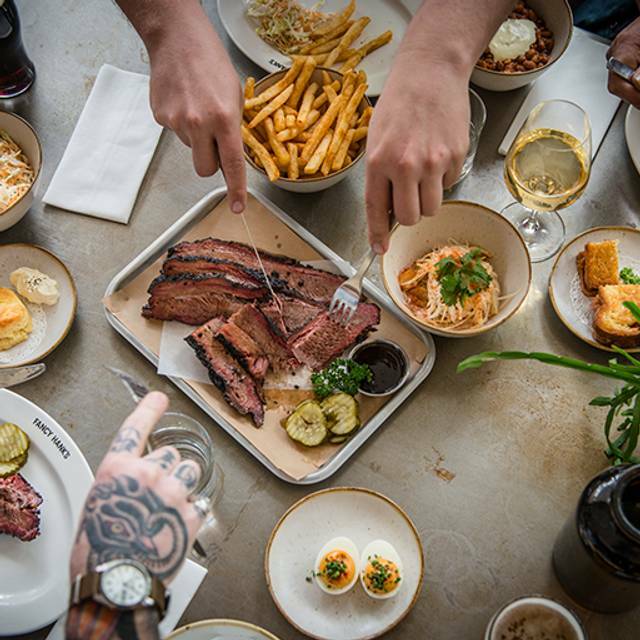 From Tuesday 12th March until Thursday 14th March, Elliott Moss will take over Fancy Hank’s kitchen for dinner, creating a series of special dishes that will showcase some of Moss’ famed North Carolina barbecue fare. 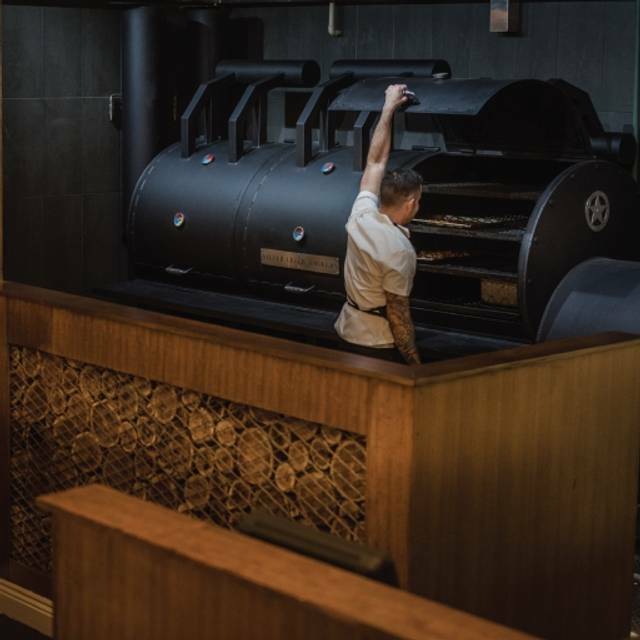 At Fancy Hank's we serve American-style, slow cooked BBQ, using the finest quality free range meats, cooked using our custom-built, 2-tonne smoker. 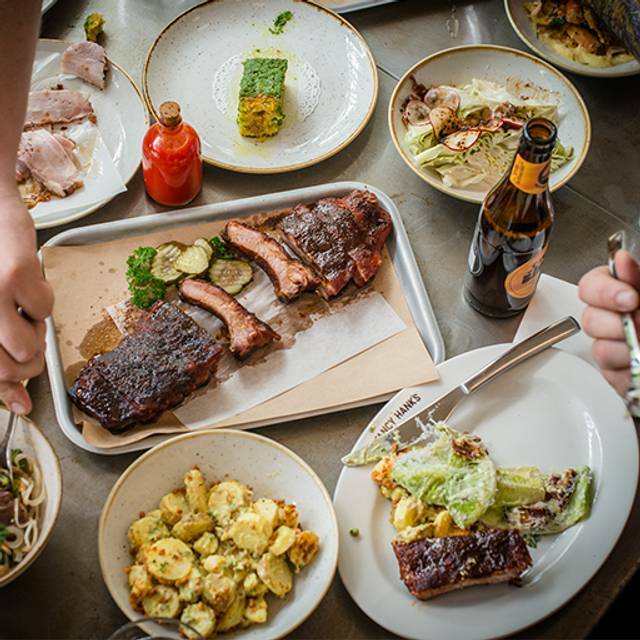 Brisket, ribs and pulled-pork sit alongside the traditional sides as well as a number of unique dishes. We use traditional Southern cooking techniques and combine these with local produce to put our uniquely Australian spin on this regional American cuisine. Ribs were well cooked but lacked intensity, the chicken wings had more flavour. We felt some of the serving sizes were misrepresented and staff could have more attentive. Brisket was amazing, still thinking about it 2 days later! Standard fair of Mac n cheese and corn bread were great, the jalopeno cream cheese was beautiful. The pork ribs were a big let down, great flavour but we’re a bit tough and a touch dry. $50 for half a rack was a joke, if the rest wasn’t so good I would have made a fuss at bill time. Service was exceptional, our food was out in under 15mins from ordering. We will go back again in the future. 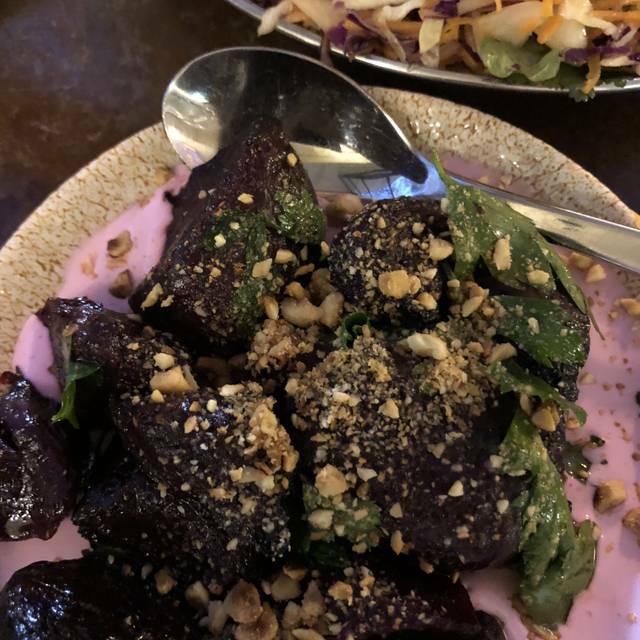 Great food, amazing service and accommodated my nut allergy with ease. Quick service, quiet and friendly atmosphere. The food was great and tasty. The only disappointment was the $60 rack of ribs- very tasty but very expensive and very little meat on the bones. Would come back but would not order the ribs again. 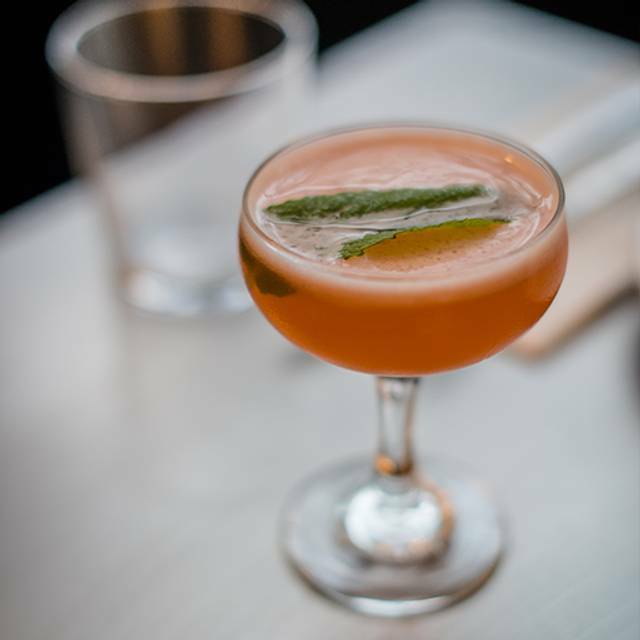 My wife and I went to Fancy Hank's between halves of a two-part show at the Princess Theatre. The location is great if you are in the theatre district! Being form the US and having traveled extensively throughout the country, we know BBQ quite well. 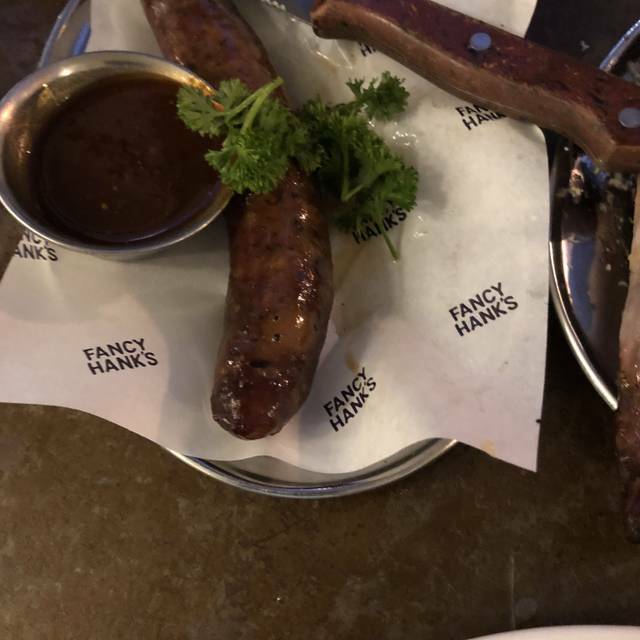 Fancy Hank's isn't really authentic American BBQ, but that is not meant as a criticism -- the food is excellent top to bottom. First, the ribs: they were cooked perfectly, with a very nice sauce. The menu said it was an "Alabama BBG sauce" and that was part of it, but then there was a drizzle of something else that added another layer of flavor. So like I said, I wouldn't call it authentic, but more of a Melbourne twist and slightly more upscale version of the original. Second, I would be remiss if I did not mention that AMAZING biscuits. You simply must order the black pepper biscuit with maple butter. These are the best biscuits I have ever had -- just the right crumb and crust on the outside, beautiful texture on the inside with a very nice maple butter that is just right int terms of sweetness. Add in the good service and fine drinks, and this made for a perfect stop for us between shows. I would definitely put this on my pre-theatre stop next time I'm in Melbourne. It used to be my favourite place to eat whenever I came to Melbourne but it has gone so downhill. This will be the last time I will eat here. Hi Elizabeth, glad you enjoyed your meal. Looking forward to seeing you again soon! We were given a really bad table in the lower corner even though we had booked in advance. It was right next to the where the bartender kept banging plates after washing especially as the table was lower and the plates were ear level. Made the experience poor. 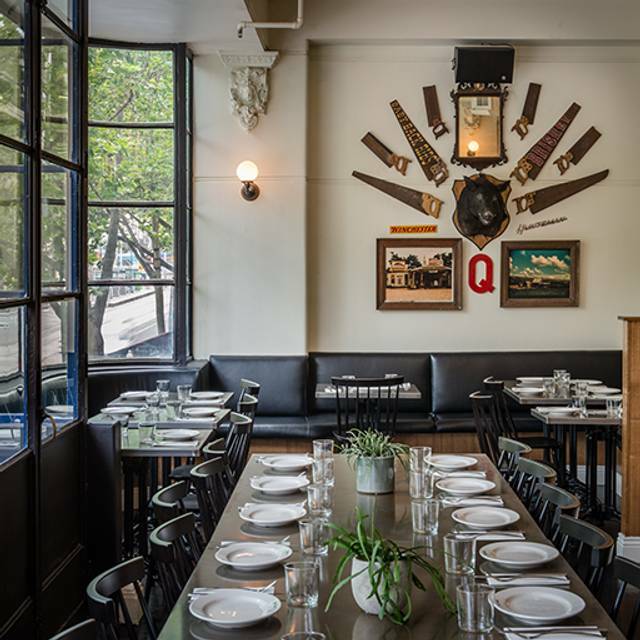 Solid barbecue food with interesting starters in a great venue. 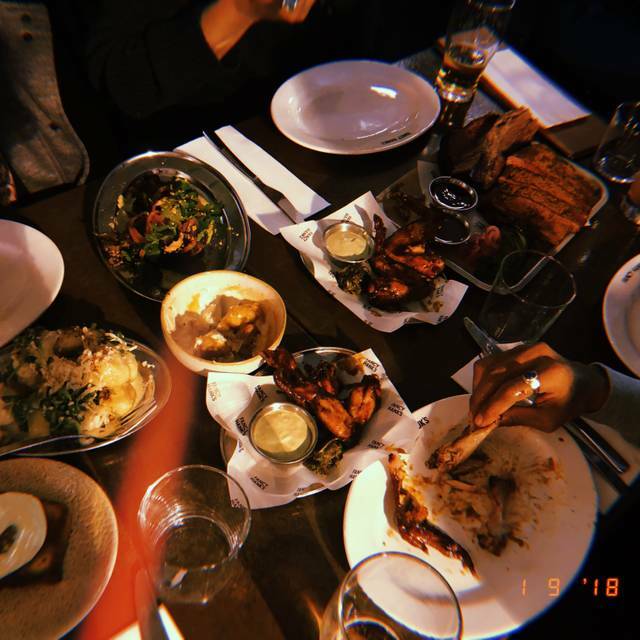 We came towards the end of the evening and a few of our dishes came to the table luke warm, when we pointed this out they happily replaced them with piping hot dishes and even took 20% off our bill for the inconvenience. Out of the 8 people on our table, four of us traveled from Gippsland, and would do it again. We really enjoyed the food, the service was friendly, the room is full of nostalgia, the bar looked fabulous and though our table was on the outside it was still loud. That’s not enough to stop us coming back. We definitely will see you in the future. Thank you all round. We were having a wonderful meal while celebrating a family birthday. This all changed when we were asked to clear the table as they needed it. We were eating desert. How rude! - I had to ask twice for the bill. By this point we were just desperate to leave but we couldn't even do that! - the restaurant was relatively busy but there were a number of vacant tables. There was no reason the service should have been this bad. - a couple next to us waited over 1.5 hours for their food. They also complained at the end and got the exact same ' thank you for your feedback' mantra. - there was no sense of urgency from anyone in the restaurant. Clearly, the training and leadership is non-existent. How this place is still trading in such a vibrant culinary scene is beyond me. We went to Fancy Hanks on a Sunday night and whilst the restaurant was quiet, the service, particularly for drinks was very slow. The food was good, not as great as on previous occasions, seems the recipes may have changed for some favourites such as the coleslaw and mac n cheese, however we did still enjoy our orders and as always there was way too much for us to finish. A good standby to catch up with friends, but seems to have slipped a little. A little surprised at a place where their catch cry is the protein & it being bbq & their was no 1/2 chicken left when we ordered .. I do commend the staff & the management for the compensation we received without even requesting anything - hsts off. The food was great no doubt. ONE OF THE MOST DISAPPOINTING EVENINGS MY WIFE AND I HAVE EXPERIENCED. MANAGER DIDN'T EVEN MAKE THE TIME TO CONVEY WITH US. FOOD WAS SALTY COLD OVER MARINATED. WE WERE BOTH FEELING UNWELL YESTERDAY. WORST EXPERIENCE EVER. ONLY PUT A 500GM RACK ASIDE FOR BOTH OF US AFTER ADVISING BOTH IN SPECIAL ORDER CONDITIONS THROUGH YOUR BOOKING AS WELL AS RING THE VENUE ON FRIDAY AFTERNOON . JUST AS WELL CAUSE THE FOOD WAS DISGUSTING. WELL TELL ALL MY FRIEND'S AND FAMILY AND SOCIAL MEDIA NOT TO VISIT. Opentable wrote to us asserting that we did not show up for our reservation in which we arrived 15mins earlier. The email we received blatantly pointed this out - an attempt at trying to place blame or apply pressure on us for something that did not occur. To add salt to the wound, the food wasn’t that great either. Pls confirm with the restaurant again before contacting us assuming that we’re people off the streets that do not hold reservations or have any courtesy to call ahead if we were not planning to show up. The whole booking experience and coupled with a disappointing meal has ruined our weekend truly. Quality service and amazing food. Went to the restaurant quite late and did not have time to order a lot of food from the kitchen, but the stuff threw something together quickly and still provided us with a selection of meats that was absolutely delicious. The staff were also very welcoming and friendly and prompt at service. amazing food. every item was ab fab!!! The sides were divine. I have been to quite a few of the American BBQ places and the food here I don't believe is up to scratch. Presentation is good, some of the dishes were good but the beef ribs were sold out at 6pm on a Friday which isn't good enough. Brisket was a bit dry. Good food, great beer selection, nice and relaxed. The roof bar above is great too. Briskit was amazing. Pork ribs were a little dry though. Amazing to find good tender brisket this far from Texas. The brisket is superb and needs no sauce. We also enjoyed the pulled pork. Did not order the pork ribs as we prefer the smaller meatier baby backs, but they looked tender and tasty. The cole slaw was unusual but full of flavor. The side pickles and onions are an attempt to be unique which is fine. I’d prefer the plain version. Great spot. We approve although very pricey compared to home. Food was good, menu lacked variety. The pulled pork was luke warm, however everything tasted good. Busy, but expected on Valentine's day. Servcie was great. Would recommend. Great spot to catch up with work colleagues over lunch. The lunch menu offers some lower cost items (sandwiches) for those that find the regular menu a bit expensive. We had mostly sandwiches with some sides to share and that worked out really well. Bit disappointed to find we were charged for mayo to have with our chips, when most places offer free aioli with chips - but this is a minor quibble. Can highly recommend the brisket sandwich for fall apart deliciousness - and book a window seat overlooking Bourke St for extra atmosphere. They helped me to have the best birthday. Thanks to Nathan and Rio! Food was excellent, service was quick and nice, GREAT selection of food and drinks... BEER!! Definitely the place for dinner and a couple drinks. Great ambience, service and attention to detail in the delicious food. Loved that we were not blasted with loud music and were able to hear each other. Great setting and environment. A little disappointed that the offer of water for a table of 8 ( it arrived in 3 open carafe's) did not mention that we were being charged for whatever tap/post mix it came out of. Other than that, we had the set menu @$35 and there was flawless BBQ, great cornbread, chips, potato salad, beans and we were all left feeling replete with some meat left on the platter! After being shown to table, unfortunately ignored by waitress. However male staff member made up for it when we explained we had a show to get to. Ordered the Pulled Pork Shoulder Special and it didn't disappoint. Would bother with the Lamb Ribs again, way too fatty and didn't really get any cherry/sweet flavour. Coleslaw with chipotle dressing was very tasty and went well with the meats, as did the BBQ fries. Love the idea of share plates. 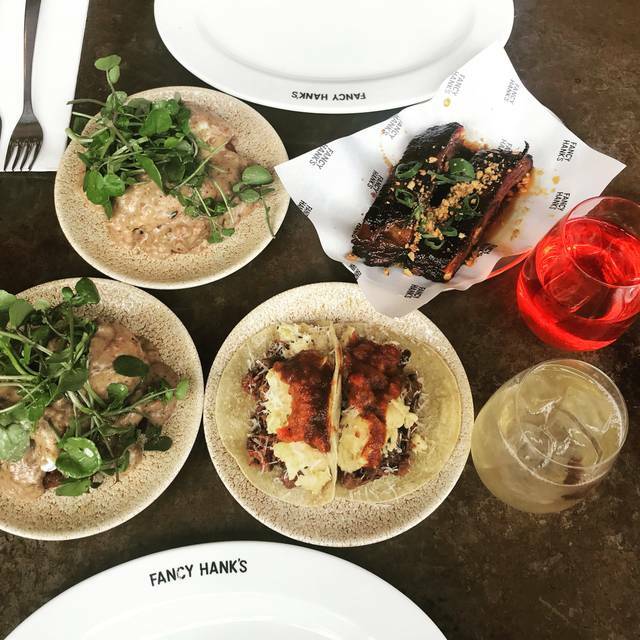 Love Fancy Hanks, the pre ordered Pork Ribs are the go! everything on the menu is spot on. The ribs were so tough we couldn't eat them. When we complained we were told this was 'Kansas' style. I feel certain the ribs in Kansas aren't like slabs of rubber. We were only offered drinks once and the start. The sides were nice but for $90 for tough inedible ribs was not.